The Cartier Tank Solo series is one of the best known collections worldwide. The straight edged design has found popularity among women with slim wrists. 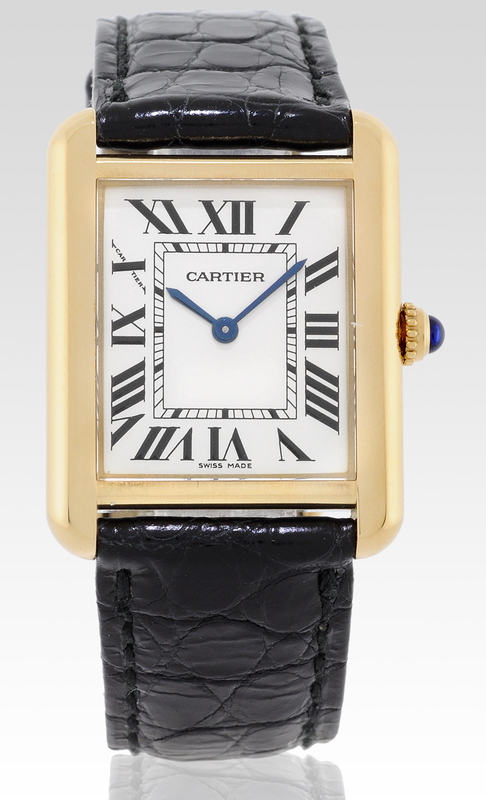 The Tank Solo W1018755 upholds the Cartier tradition of characteristic form and presence. The sleek design of the Tank Solo fits a feminine wrist with ease. 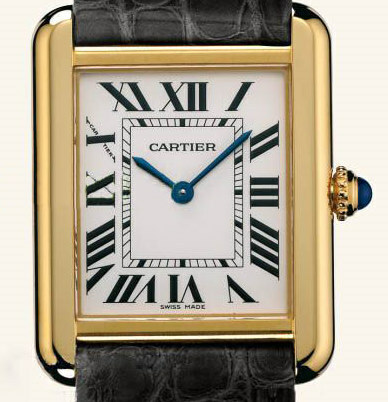 The first of the Cartier Tank series was crafted back in 1917 and was inspired by the Renault tank introduced in WWI. Since its initial creation, over thirty new brands of the Cartier Tank line have been created, including the Cartier Tank Solo. As with its name, the Tank Solo stands out from the crowd with a valiant appearance of gold on black. The Roman numerals that mark the hours are displayed in bold, black lettering. 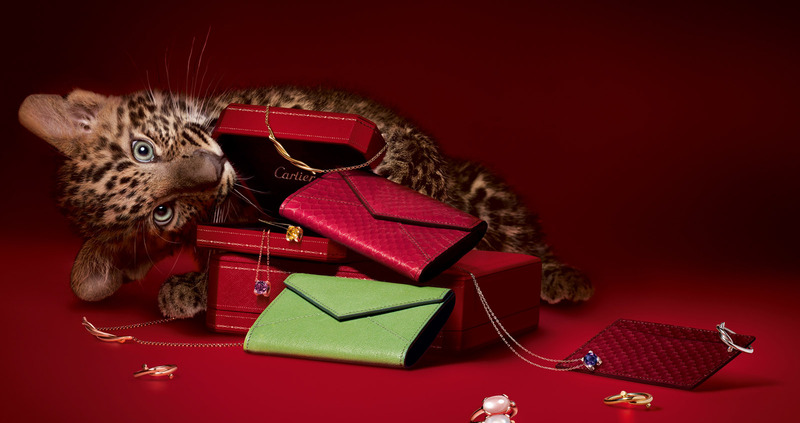 The case is made from real 18 karat goldand is secured by a steel screw down case in the back. The W1018755 runs off of a Cartier Caliber 157 Quartz movement, providing the accurate time keeping that is synonymous with Swiss manufacturing. The Tank series is recognized as a prestigious series, worn here by Angelina Jolie. The silver opaline dial is smooth and rectangular with Rail-track markings around the dial to define the minutes. The two sword-shaped hands that spin along the dial provide clear visibility thanks to the bright material of blue steel they are made from. The circular-grained crown on the side is also made from 18k yellow gold and is set with a sapphire spinel on its top for accentuated appearance. The strap is made from the finest alligator leather, dyed black to create a striking contrast between it and the gold casing. The leather clasp is made from 18 karat gold like the rest of the case. The dial of the Tank Solo is guaranteed to be scratch resistant thanks to its sapphire crystal plating. The Tank Solo is water resistant up to 30 Meters so you don’t need to be afraid if it gets a little wet, but it is a dress watch and therefore unsuited for swimming or diving. The alligator leather bracelet is also susceptible to water damage and should be kept from prolonged exposure to liquid. 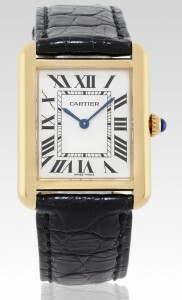 Cartier is renowned for providing the finest quality of luxury watches and the Tank series is no exception. This luxury watch retails at $4,100 and is available in numerous sizes. The Tank Solo W1018755, as well as other variations of its class, are superiorly designed dress watches made to fit any lady of discriminating fashion.